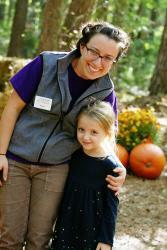 Emma Nadeau is the Volunteer Coordinator at the North Carolina Museum of Life and Science. They have 150 to 200 volunteer logging in over 20,000 hours each year. Some volunteers work on a weekly basis, while others work special events They have an animal department, where volunteers work with farm animals and other animals for education purposes. They have a tropical butterfly house with someone staffing at all times to make sure the butterflies don't get out. They have an investigative health lab with different experiments each week, and then they have special events, fundraising, education, and adult only events, which rely heavily on volunteers. Before using Track it Forward, they had different departments tracking hours in different ways. They started using Track it Forward in the end of 2013, and now every department uses the same system for tracking hours. “It’s very useful to be able to log in and see the total hours volunteered according to each department and according to each activity,” says Nadeau. Also, volunteers are offered a free membership after completing 100 or more hours of service in a year. This is tracked with the Milestones feature. The Museum tracks volunteer hours for reporting purposes and frequently uses data on volunteer hours to apply for grants and get funding. Emma loves her job at the Museum of Life and Science, a place where there is always a variety of people, and everyone is constantly learning and being curious. She has a good system in place for managing and tracking volunteers, and that makes her job so much more enjoyable.